Create a tapestry of color by doing a flower garden design. Plan your garden changes to have a garden that impresses throughout the whole year. With my guidance you can weave a new look into your garden by choosing colorful seasonal plants. I just love the amazing variety of plants to choose from for my flower garden design. My garden always looks different. I don’t change the trees and shrubs, but the constant change of pretty flowers creates an oasis for my soul. Do you need an instant flower garden for a special occasion and your garden just looks awful? Get a few tips to quickly brighten up your garden and delight your guests. It may require some hard work, but is that special occasion not worth it? Design your garden by following the steps outlined on our garden design page. First place all your hard landscaping, trees and shrubs. Next decide on the perennials, and finally the pretty annual border flowers. Michigan offers a design for an endless bloom perennial garden . The size of your borders can vary, but should fit in with the overall flower garden design. A wider border will take more flowers, will be more expensive to plant every season, but will be more magnificent. A narrower border will require fewer plants, but you may be able to afford more exotic or expensive flowers. There are endless possibilities, only limited by your imagination. Just keep to the design principles ! Choose more or less five to ten different plants for your flower garden design. Decide on a pattern and repeat it throughout. This creates the best effect. 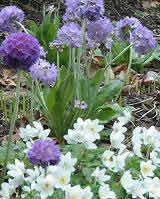 Also use clumps of the same flowers in your flower garden design. Single plants don’t make a statement, but a group does. Look at the planting requirements of all the flowers you have chosen, and draw up a planting schedule for the year. Include the times when bulbs need to be lifted, or pruning done. 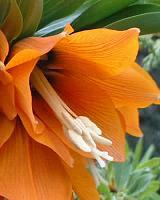 When lifting bulbs you will disturb the surrounding soil, and any delicate seedlings in it. So plan the spacing of the plants well. The planning may seem unnecessary, but it will help you to grow a garden that will always look good. The planning will also save you money. You will not get taken in by a pretty plant at the nursery, get home, and not know what to do with it! Autumn normally signifies the introduction to the end of the year. The winter will soon be arriving. The dead leaves of summer are raked away and dumped on the compost heap. This is for future use. Evergreen trees and shrubs put out fibrous roots. Autumn is the time to plant out spring bedding in the positions that you want. In the winter, polyanthus, forget-me-nots, pansies and wallflowers look pretty. Their colors brighten up our lives. You can easily grow these from seeds. The cheapest flower gardens are grown from seeds. In winter, garden work is unpleasant. This is especially true when it is windy and cold. In winter, we plan our gardens. A well planned garden is worth all the time and effort. It is also very rewarding. There are jobs to be done, like, cleaning the shed, garage, also getting tools sharpened for the pruning season. The winter garden could be interesting; it could smell deliciously fragrant with the early blooms of Hamamelis and Viburnum. Hollies look very Christmassy with their bright berries. Extend your flower garden design beyond flowers. The stems of different colored barks and shrubs also look beautiful. This makes a lovely backdrop for winter flowers. Before you know it the sun shines brighter, longer and warmer. The wind whispers and the birds sing that spring is in the air. The first flowers appear that you planted in autumn. The garden is carpeted with snowdrops (Glanthus nivalis), crocus, cyclamen, tulips, winter aconites, irises, daffodils an miniature daffodils. With the spring comes new life. All the trees and shrubs wake up. They are the backbone and framework for your garden. It is so important to celebrate the each new season and appreciate the beauties that it brings with it. Crocuses flourish when they are planted naturally in grass (lawn). Only mow when the flowers have died down. Include hanging baskets in your flower garden design. Hanging baskets and window boxes brighten up your home when planted up. They may contain pansies, trailing ivies, heather (Erica carnea), flowering bulbs and other plants. Remember to feed your hanging basket and flower boxes with a good plant food. It is at this time in early spring that you prune the shrubs that bloomed in late summer. These are the fully hardy shrubs e.g. Rose of Sharon (Buddleja daviddii), Hypericum calycinum and Spiraea douglasii. Less hardy shrubs must only be pruned after all severe frosts have passed, e.g. hydrangea, fuchsia and ceanothus. The trees are also to be pruned before the new foliage appears. Remove all dead wood and flower heads. Roses need to be pruned to prepare them for flowering. Visit our rose pruning page for all the essential information on rose pruning. Wisterias need to be pruned twice a year. In summer prune long side-growth back to four or five leaves. In winter shorten back to two buds. The soil has warmed, the ground now has to be prepared for the summer flowering bulbs and plants. Order your bulbs in summer for autumn planting. In spring some beautiful flowering sights may be seen. Grape hyacinth(Muscari neglectum) make a gorgeous blue carpet. In between the hyacinths bright yellow daffodils appear. The yellow and blue complement each other. Bright red tulips look good with different colored primroses. Tulipa Kaufmanniana “Gaiety” look like water lily tulips. These are a permanent feature in the garden. They remain in the ground and come up year after year. I believe that tulips are essential for a flower garden design. Well … it is my taste! Drumstick primulas (Primula denticulate) and Primula “Dawn Ansell”. Plant your flowers in masses to create the most impact. Primulas like rich well drained soil. Anemone appenina forms a low carpet or ground cover. It looks lovely amongst trees and between shrubs with its small mauve and white flowers. Ipheion uniflorum “Violceum”, is a front border plant. Pulmonaria officinalis “Sissinghurst white” produces flowers from late winter. Bergenia “Silberlicht” gets early spring flowers and has an elephant ear shaped leaf. Helleborus lividus subsp corsicus gets pale green flowers. Erythrorium has pretty flowers blooming with upturned petals and heads facing downward like Dutch bonnets. They increase if left undisturbed. Shrubs are the backbone of the flower garden design. Early flowering shrubs are truly magnificent. One of my favorite shrubs is Magnolia stellata. This is one of the first to flower and is covered in small white flowers that look like stars. This shrub looks amazing at night if lit up with garden lighting . Rhododendrons and Camelias are also beautiful. Some of our rhododendron and camellia pictures testify to this! Forsythia looks good with its golden yellow flowers. Viburnum x burkwoodii gets fragrant flowers. They are pink and white when open. In preparing for summer bedding, sow half hardy annuals. Make sure you have enough potash fertilizer in your beds if Fritillaria imperialis is a part of your spring border. Without potash, Fritillaria will not flower. Snakeshead (Fritillaria meleagris) has a very interesting looking flower with unusual markings. They do well in meadow type flower beds. A lovely plant to have is Veronica peduncularis “Georgia Blue”. This plant caries blooms in each month of the year. Arum creticum also makes a spectacular display in spring. They should be planted in autumn. They also like well drained soil. Aubrieta deltoidea is lovely for a flower garden design. It creeps into open spaces. It grows in the poorest of soils. It forms a carpet of pink, dark pink to violet flowers. Cut your Aubrieta back hard after it has flowered, removing the dead flowers and some foliage. It will replenish itself. A beautiful flowering groundcover which also creeps into the branches of trees is clemantis. Pink clemantis could look beautiful with deep purple colored bulbs or flowers in between. Aster novi-belgii and the Michaelmas daisies will flower from late summer to autumn. After they have flowered, it is time for them to be divided. If you don’t divide them regularly they become woody. They dry out in the center and don’t produce many flowers. Hardy annuals for example clarkia don’t require much care and can grow in poor soil. Wisteria floribunda looks truly magnificent in early summer. Wisteria floribunda “alba” all in white, smells fragrant and also looks magnificent. The end of spring is the time to sow the seeds of hardy biennials such as forget-me-nots, foxgloves, sweet Williams, honesty and wall flowers. By autumn they will be large enough to transplant into beds and borders where they are to flower. You can also sow them where you want them to flower. You will however have to thin them out. By carefully thinning out the plants, the remainder of the plants will be stronger and produce better flowers. If a biennial produces a flower bud in the first year, pinch it out. If you don’t, your flowers will be poorer in the main flowering season. During summer Tagetes patula, Gazinia and Slavia splendens work well in a bed. Other Summer plants to consider for your flower garden design are; geraniums, dicentras, gladiolus, irises, Scarbiosa caucasica, Lupinus polyphyllus, Alchemilla mollis, Premula helodsca, Dianthus, pretty Paeonia officinalis, Papawer orientale, Hostas sieboldiana, the list goes on and on. Roses, and the lovely tall growing and flowering Delphiniums need support. Lavandula stoechas looks good lining pathways or as border plants. Lavatena “Barnsley” is a shrub that flowers profusely. It likes sun and well draining soil. Clematis “Mrs Cholmandeley” produces lavender/blue flowers in early summer. It needs to be pruned in early spring to produce the summer flowers. There are many, many flowering plants to choose from. Remember less is more. Plan and plant your garden well. Use the color wheel. Colors on the opposite sides of the color wheel complement each other. White flowers however do look beautiful in a garden with blues, purples or other colors. Solanum jasminoides “Album” is a beautiful white climber. It looks very good as a backdrop where white flowers are dominant. Campanula latiloba alba “all white”, looks good in front of the jasminoides in an all white garden. All white gardens tend to look spectacular at night. Seriously consider garden lighting in your flower garden design. The seeds can be sown under glass in moist compost. Sow the seeds sparingly. As soon as the seeds break through remove the glass. Thin out if too many pop up. The seeds can also be sown directly into the soil. Always buy good quality seed. Henry Fields Seed and Nursery provides excellent seed at competitive prices. Most annual plants can be sown directly into the ground from early spring onwards. These will flower in summer. Some hybrids need to be started out in trays, then planted out in the garden when well established. Read the sowing instructions on the seed packet. Some flowers take longer to flower than others. Sow according to your planting plan that you put together during the winter months. Group the flowers together according to color, water requirements, shade, and height. The tall varieties need to go to the back of the bed. The shorter varieties are planted in the front. It the bed is in the middle of the lawn for example, the taller varieties need to grow in the middle of the bed. Take this into account when doing your flower garden design. Sow the flowers seeds in clumps. This creates the best effect.Mark out the sowing area with a hoe. In each area, seeds may be sown in grooves or drills. Seeds may also be scattered and the covered with a thin layer of compost. If you sow seeds in lines or drills, weeding will be easier. Drills, 1 cm deep, should be made with the edge of a rake. Drills for tall narrow plants should be spaced apart at a distance of half the eventual height of the plant. It is important to see what the mature size of the plant will eventually be. After sowing seeds in drills, cover them lightly by drawing a rake along the length of the drill. Very fine seeds may be scattered on the surface and left. Protect them from the full sun. Always sow seeds thinly. Very small seeds should first be mixed with fine sand in a container. This makes it easier to distribute them thinly. When you have planted your seeds, use a fine rose attachment on your watering can to water your seeds. Mind the birds, they love eating seeds. Maybe placing a bird net over the bed is a good idea. If not, place a scarecrow in the garden. Cultivate seedlings if you have the space or purchase them from a supplier (it could be expensive if you have a large garden). A simpler option is to sow the seeds where you want the flowers to bloom. Just keep in mind that it could take up to 3 months between sowing the seeds and flowering. Oh..there are so many things to consider. How do I make head or tail of it? You do not have to be an expert! Just carefully research your favorite flowers, review the garden design principles, and start your flower garden design. Once you have taken the first step, it becomes easier. Review your first plan carefully. Sleep over it, go to the nursery a few times, look at plants and then adjust the flower garden design to reflect the things you have learnt. Don’t stress to much. Annuals are planted new every year. So each year you may repeat the exercise and improve! Before many years have past you will be an expert on your own garden! Need some excellent Landscaping Ideas?